Wayfinding Planning — Nicolson Associates, Inc.
Wayfinding is a process we use to help people know where they are and find their destination. Wayfinding and Signage Design are related but different disciplines. Every Sign Design project requires Wayfinding Planning, sign locations and messages must be coordinated to make movement through a space easy and comprehensible. Wayfinding consultation services are provided on two levels. 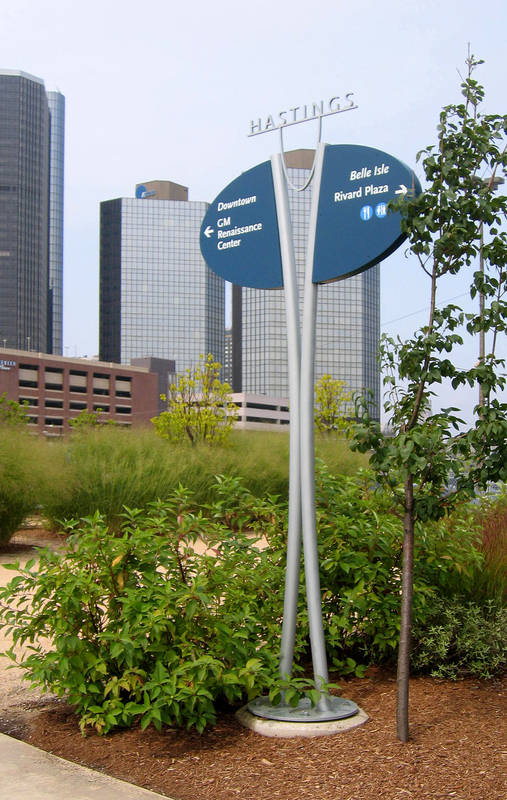 Wayfinding Planning is the process of determining sign locations and sign messages. This includes determining destinations, entry points, nomenclature, considering special needs, and analyzing sign locations, landscaping, lighting, etc.. The results of Wayfinding Planning include a report detailing our findings, a message schedule and sign location plans. If a project is large, or the facility is complex, or the audience has special needs, there is a need for a Wayfinding Masterplan. A Masterplan starts with a more in-depth study of the issues that make finding your way difficult. The Masterplan also makes recommendations to improve elements other than signage like pre-visit information, maps, how employees give directions, on-line directions and maps, landmarks, interior design and more. When Wayfinding Masterplanning services are required NIcolson Associates joins forces with Carpman Grant Associates' Jan Carpman and Myron Grant.